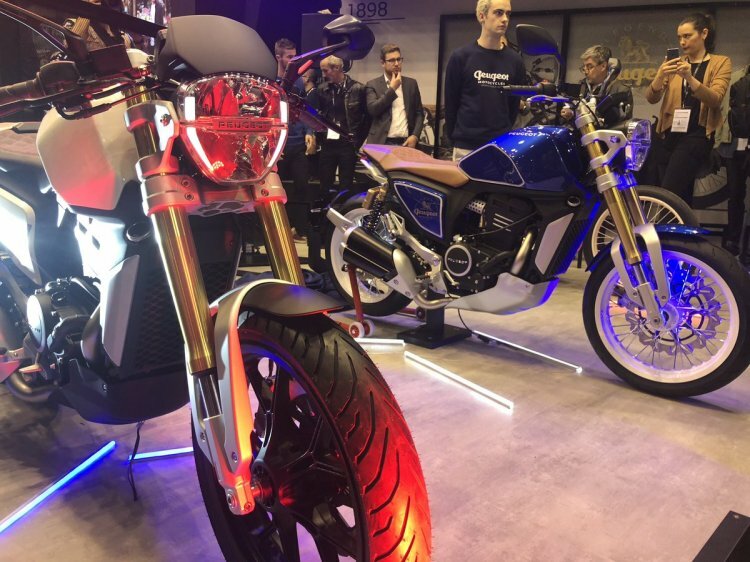 Mahindra-owned Peugeot Motorcycles have unveiled two new concepts at the Paris Motor Show 2018 - Peugeot P2x Roadster and the Peugeot P2x Cafe Racer. The Peugeot P2x Cafe Racer Concept features clip-on handlebars, a single seat with a cowl and aggressive riding posture. Peugeot Motorcycles has made a comeback into the motorbike business after a hiatus of 70 years. The Peugeot P2x Café Racer is a modern-retro café racer that features an aggressive riding posture. While both the bikes share most of the components with each other, key differentiators include the clip-on handlebars, alloy wheels and a rear cowl. The headlight, tear-drop fuel tank, and the short front fender are shared with the P2x Roadster. The Y-spoke alloy wheels wrap on slightly different Pirelli tyres, while the USD front forks and twin shock absorbers at the back are similar to the roadster. The Peugeot P2x Roadster is a modern-classic street bike that features an oval LED headlight with DRLs, raised handlebar, sculpted tear-drop fuel tank, short front fender and a step-up seat. It comes shod with wire-spoke wheels wrapped in Pirelli Diablo Rosso II tyres. Suspension components include inverted front forks and twin coil-spring shock absorbers at the back from Gabriel. Peugeot Motorcycles has revealed that both the bikes source power from a 300 cc, single-cylinder, liquid-cooled, DOHC motor. While the company hasn’t announced the power figures of this engine, from the looks, it seems to be the same unit from the Mahindra Mojo. In the Mojo, the 300 cc, fuel injected mill produces 27 bhp of maximum power and 30 Nm of peak torque. It is mated to a 6-speed transmission. While Peugeot Motorcycles haven’t confirmed the Mahindra Mojo connection, most of the components and cycle parts are shared with this model. For instance, the switchgear, USD forks and alloys are similar to the Mojo. Moreover, petal disc brakes and the J.Juan callipers are the same. 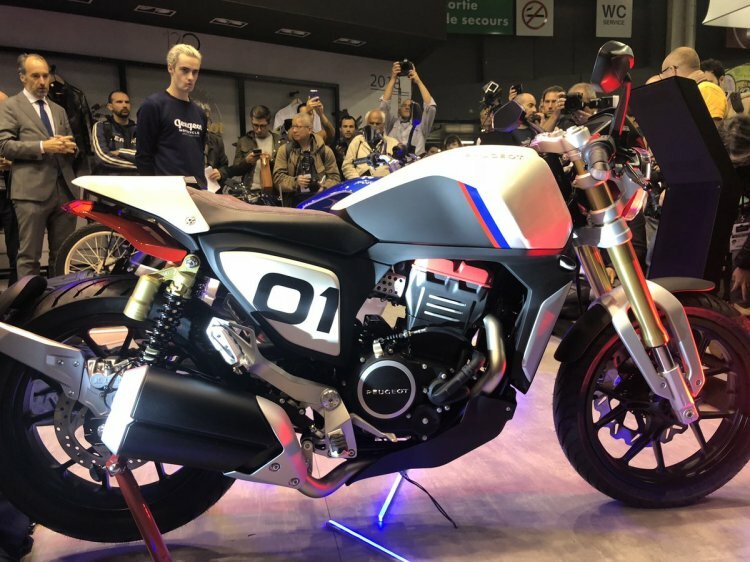 That said, both the bikes feature dual-channel ABS and a 5-inch instrument cluster with an I-Connect system for Smartphone connectivity. The Peugeot P2x Roadster Concept (Blue) features an upright riding ergonomics, wire-spoke wheels and wide handlebars. Costantino Sambuy, CEO, Peugeot Motorcycles, has said that the Peugeot P2x Roadster and the Peugeot P2x Café Racer will initially go on sale in Europe by 2020. Regarding the Indian launch plans, the company says it's challenging to manufacture the bikes at low cost. We can expect Mahindra Two-Wheelers to launch both the bikes in India through its Classic Legends (CLPL) subsidiary, though.